Since 2002 the ZOOM campaign invites children all over Europe to make their daily journeys independently and in a climate-friendly way. By collecting so-called Green Footprints all over Europe, the children show the "big ones", what the "small ones" do to protect the global climate! During an activity week on sustainable mobility each journey absolved on foot, by bike, skater, bus, train etc. counts one "Green Footprint". Climate Alliance will be handing over the total amount of collected "Green Footprints" to the participants of the UN-Climate Change Conference. 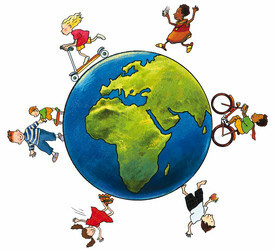 Each year from April until the beginning of the UN Climate Summit children aged 4-12 years from all over Europe are asked to hold their activity week(s) on Climate Chance. At the end of the year Climate Alliance will hand over the Green Footprints collected by children all over Europe to the participants of the United Nations annual Climate Summit. Join in on our symbolic Climate Voyage around the One World to learn more about the world's climate situation. Our journey starts in Europe at UN Climate Secretariat in Bonn, Germany and - travelling once around the world - ends at the venue of the annual UN Climate Conference. Short stopovers on every continent help us to understand some more about worldwide problems caused by climate change. Climate Alliance offers several modules and materials as downloads that can help to organise your ZOOM-Activities in your school or municipality. The ZOOM campaign aims to help children to make their daily journeys independently and in an environmentally-friendly way. The modules and materials produced within the campaign offer concrete ideas and activities for teachers, parents and children. Kindergarten and primary-school children, and their parents, will increase awareness of eco-friendly mobility by getting involved with activities covering the topics sustainability, climate and traffic in a playful way. Road safety in municipalities can be improved with the help of the local Children’s Mobility Reports, developed in the project, which will also enhance the conditions for children to travel independently and therefore reduce needless journeys by adults just to accompany children. a feeling of community between children is established. create opportunities for children to have their voice heard in local town planning issues.